We read The Outsiders at the start of the year and one important piece of reading the novel is acquiring new vocabulary. The other day I wrote about using visuals to reach all learners. When I am working with students with disabilities, ESL/ELL, or at-risk students I find that getting on their level and in their world helps them make connections, especially in vocabulary. Here is the vocabulary list for The Outsiders (one word per chapter). Each day a new word is presented and students are asked to copy the word and definition. They also need to locate the sentence in the novel and write it in their journal. This list is used with most of the 8th grade classes. Here are some sample pages from the SMARTNotebook file I created for our inclusion class. 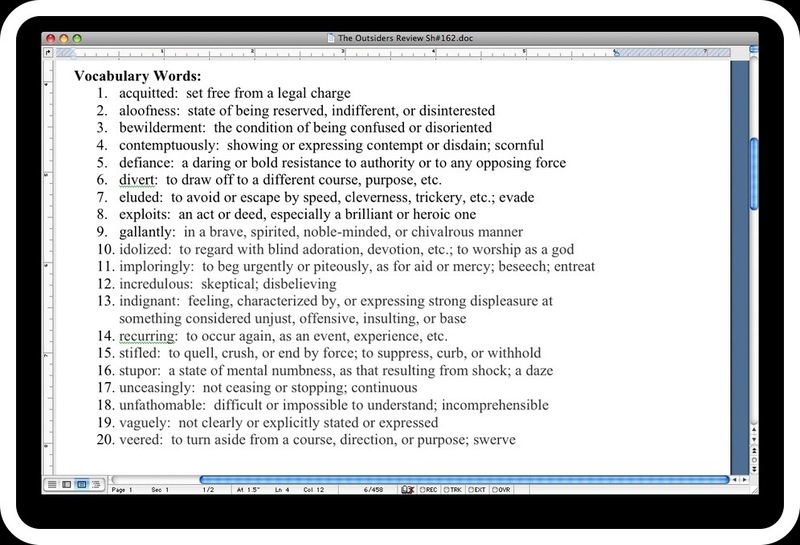 The definitions are not only pared down a bit, but each page includes a graphic and the sentence from the novel. 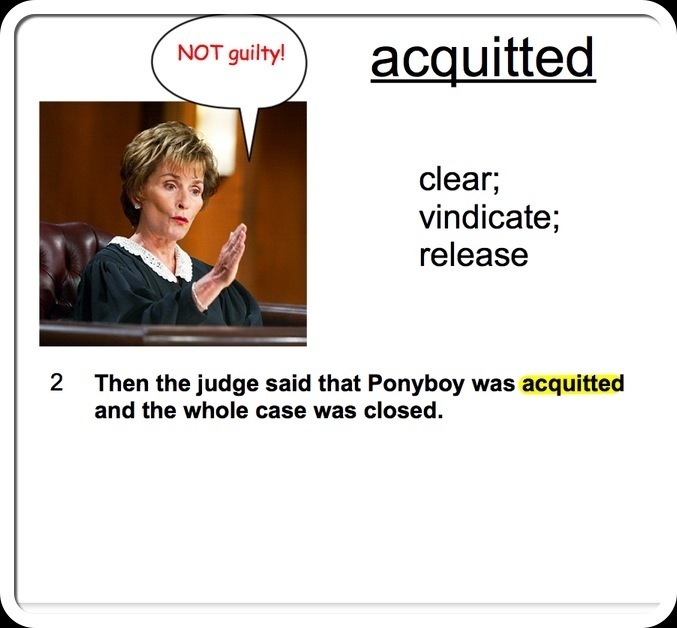 As we review the vocabulary and later test over it, students can picture Judge Judy and Wile E. Coyote and apply this knowledge. 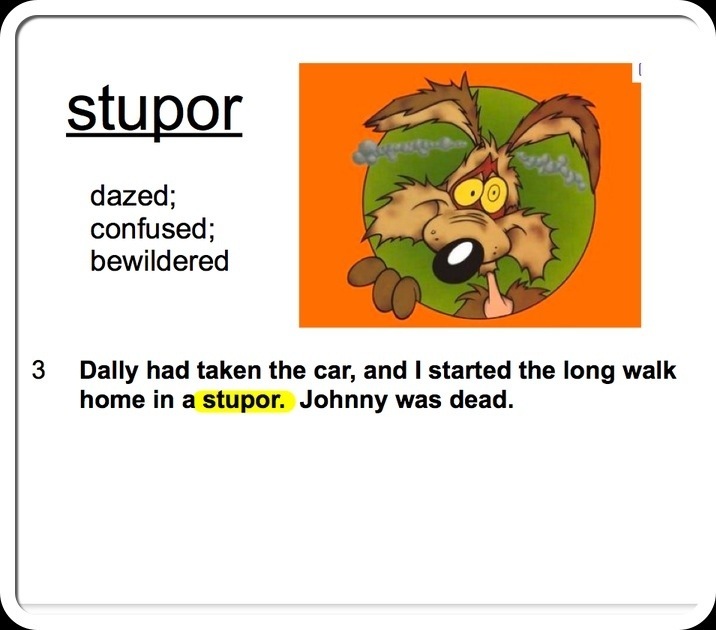 Because these vocabulary words are made on SMARTNotebook, students can download them from our Edmodo page, view them online, or print them and cut them out to make flashcards. (You have to print to the “large” or “medium” setting for usable flashcards.) I typically provide a copy of these to each of the students who require such an accommodation on their IEP. I also make a class set to use for review games during our intervention study hall. 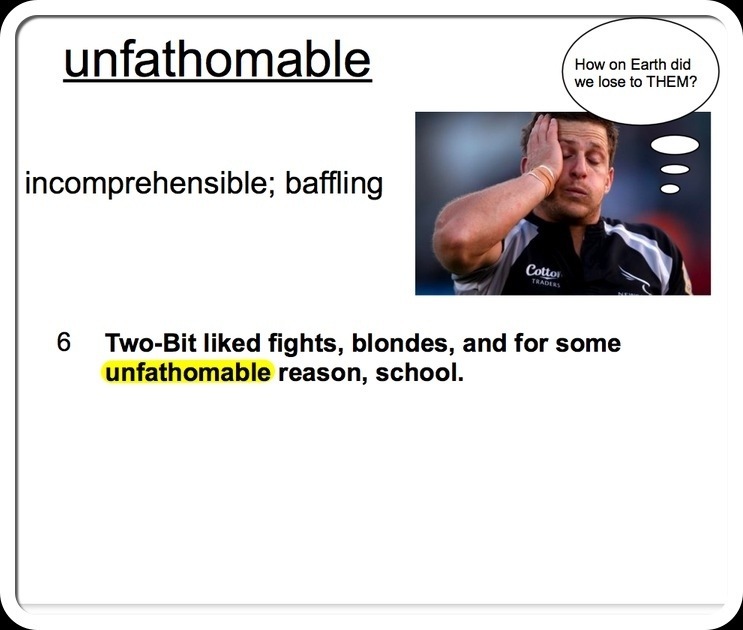 And it should be no surprise, It is also way more fun to teach vocabulary like this. Love this. As a newish teacher, I often get overwhelmed by the extra prep time spent making stuff like this. Do you have any tips on how to speed up the process? Do you find yourself making new materials all the time or do you reuse stuff you’ve made in the past? This has taken three years to do. I add to and tweak my SMARTnotebook files every year. They just keep getting bigger and bigger. I know you don’t have a SMARTBoard. Do you use a projector? What program do you use to design a lesson? I think I am just so visually inclined that I think of these graphics and images quickly and I google them and it’s done. Trust me, once you get in a groove with PowerPoint or another form of presentation technology, it will make your life easier in the long run. You won’t be starting from scratch everytime. Do you make your materials at home or only during school time? Let me look around for some ideas. I know you’re right, I just need to get over my dislike of hooking up my annoying laptop (the Elmo has trouble finding it half the time). But, you’ve inspired me to give it a shot. I can see how it makes a big difference in the long run. Excited now! I make my materials at home and at school… Trying to get more done at school and less at home though 😉 Thanks for the tips! I stay a few nights each week for about an hour but I try really hard to use my prep period and sometimes my lunch to do my work. I don’t get much done at home with the kids so I don’t bother bringing anything home if I can absolutely avoid it. That makes sense. This year my goal is to only stay for an hour or so after school each day… Last year I got sucked into all kinds of new teacher traps and burned myself out. I think the PowerPoints will be worth it tho!